As a vegetarian, I am often battling meat-eating friends on the issue of protein. I tell them that I get protein from eating a wide variety of vegetables and being sure to add-in nuts and beans every so often. A few years ago I discovered the glory of quinoa! An ancient Peruvian grain that provides a complete protein all by itself and can be used in as many forms as rice. Pronounced KEEN-wah, this grain comes in a standard ‘white’, as well as red and black forms. Each grain has a little curly white ‘tail’ that sometimes detaches during cooking. I find the red and black varieties to be crunchier in texture and delicately nutty in flavor, but expensive. I often blend two or three varieties together. I tend to explain protein sources like this: Some foods are complete proteins all by themselves like animal proteins (meat) and some vegetable sources (like quinoa). A complete protein means there is a full and balanced panel of amino acids in the food. You can also consume a complete protein by combining two or more sources with partial amino acid chains (most vegetables). For example, beans are a nutritionally dense food but they lack an amino acid that corn possesses. Eating beans and corn together gives your body a complete protein. Of course protein isn’t the only nutrient the body needs. We also must eat a fair amount of fiber, vitamins and minerals to feel balanced. However, a vegetarian source of protein can help many people reach their weight loss goals by cutting down on animal fat. Quinoa is easier for most bodies to digest than animal protein, so the body stands a better chance of absorbing all of the nutrients and energy that it can. 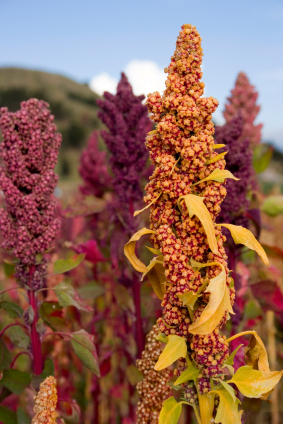 Additionally, quinoa is gluten-free, and offers a tasty and nutritious alternative to rice-based foods. Cooking quinoa is similar to cooking rice: combine 2 cups water and 1 cup quinoa and bring to a boil, reduce heat to low and cover for about 15 minutes, turn off heat, fluff and serve. The flavor of quinoa is very mild and a bit bland. Therefore, it lends itself to infinite taste combinations!